Before Jamestown and Plymouth Rock there was St. Augustine—America’s first settlement. Before Jamestown and Plymouth Rock there was St. Augustine—America’s first settlement. Spain’s Ponce de Leon ‘discovered’ northern Florida in 1513 and our tour follows the trail of European nations who shaped early America at the dawn of a New World. Treasure seekers will delight in the historic state parks, colonial neighborhoods and military forts. Pedal along coastal paths, sandy beaches, and lazy rivers at the gentle pace of manatees, stopping along the way to visit America’s oldest lighthouse and civil rights landmarks. To complement this adventure, we kayak in quiet inlets and sail aboard a blockade runner in the Atlantic at sunset. This tour offers riding almost exclusively on roadways alongside vehicular traffic. In many cases, roadways have marked bike lanes. We have chosen quieter options where possible. Scenic A1A is busier but accustomed to cyclists. There are no hills or dirt roads (except for some short dirt driveways to access some sites). Of course, your VBT van support shuttle is always available for those who need assistance or wish for a shorter ride option. 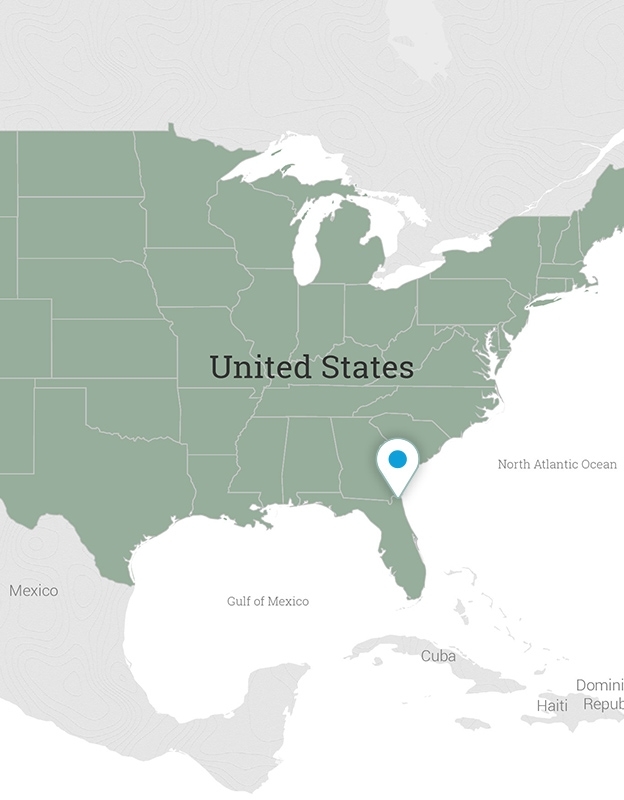 Your tour begins at the Hoyt House in Fernandina Beach on Amelia Island, Florida. If you are flying to Jacksonville, East Coast Transportation will make one complimentary transfer for VBT guests from the Jacksonville International Airport (JAX) to the inn. The shuttle works on a “show and go” basis and departs from the airport at 12:30 p.m. Shuttle reservations are neither required nor available. Connect with the shuttle on the ground floor in the “Meet and Greet” area located across from baggage claim carousel #1. The driver will be holding a VBT sign. Please note that the shuttle departs promptly at 12:30 p.m. If your flight arrives after this time, you will need to arrange your own transportation to the inn at your own expense. Taxis and shared-ride services are conveniently located on the lower level outside of baggage claim. The following companies offer transportation: Gator City Taxi, (904) 999-9999, and Go Airport Shuttle & Sedan of Jacksonville, (904) 353-8880. Travel time from Jacksonville International Airport is approximately 35 minutes. Taxi fare is approximately $60. For guests driving to the tour, free parking is available at Hoyt House and Williams House during your stay on Amelia Island. Note that your car will need to be moved to adjacent street parking, where overnight parking is permitted, for the remainder of the tour when you check out. Check-in at your Amelia Island inn. Please see your Final Travel Documents for the name and address of your inn since the group is split between two neighboring Victorian inns: Hoyt House and Williams House. Meet your VBT Trip Leaders at 2:00 p.m. at Hoyt House, dressed in cycling clothes for a bike fitting and a brief cycling-skills clinic. A warm-up ride takes you on an introductory loop through Fernandina Beach’s protected historic district. There’s time to explore on and off your bike before returning to the inn. Please use the amenities and services provided by the inn at which you are lodging. Settle into your room, then gather at 5:30 p.m. at Hoyt House for a welcome reception, followed by a 6:00 p.m. orientation meeting. Dinner tonight is at one of the town’s well-regarded restaurants. 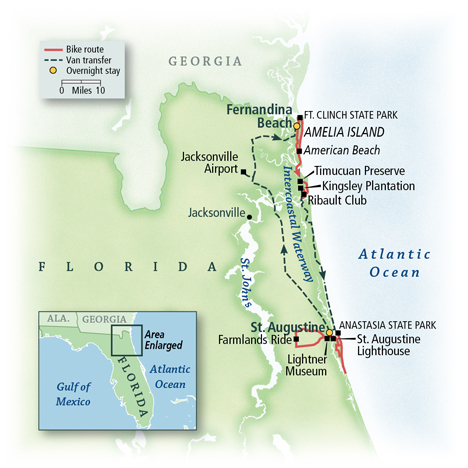 Today you set out to explore Amelia Island by bike from your inn, setting your own pace. Remarkably, Amelia Island boasts 4,000 years of history and is the only place in the U.S. to have been ruled under eight different flags. Throughout your invigorating day, you’ll circumnavigate the island, just two miles wide and 13 miles long. You pass the state’s oldest lighthouse, wide beaches, and plenty of inviting spots to stop, relax, and take in the lovely ocean vistas. In the morning, ride under live oak-canopied roads to Fort Clinch. You have time to explore the fort itself during an included guided tour by a Union soldier. You also may take the time to dig your toes into the white sand beach or wade out into the Atlantic Ocean. Pause for an included lunch at a popular restaurant along the beach. After lunch you cycle past American Beach, where the African-American community came to swim and socialize during the era of segregation. Cultural icons from Zora Neale Hurston to Ray Charles to Hank Aaron soaked up the rays here. The enclave was established by Florida’s first African-American millionaire, Abraham Lincoln Lewis, and his Afro-American Life Insurance Company. Gather at 5:00 p.m. for a social hour and a visit from a local historian. Afterwards, enjoy a relaxed stroll through the Historic District of Fernandina Beach, listed on the National Register of Historic Places and dinner on your own in one of the town’s restaurants. There are some great options where you can savor your meal al fresco. After a hearty breakfast, you hop on your bike and head south, leaving Amelia Island. Later, arrive at the Timucuan Ecological and Historical Preserve, where kayaks await you for an exciting nature excursion. After an introduction to our vessels, set out into the marshes. Your route is designed for easy paddling, allowing you the opportunity to fine-tune your skills, or to take time to observe the flora and fauna up close. The salt marsh attracts abundant wildlife. Your guide may help you spot wood storks, osprey, great blue heron, snowy egret, bald eagle, otter, and dolphin. You need not have prior kayak experience to enjoy today’s outing, an out and back paddle. Your Trip Leaders have prepared a picnic lunch of locally sourced ingredients that you will enjoy here. After lunch, continue cycling south and onto Fort George Island. You pass the Ribault Club, once a 1920s-era golf club and now a historic building on the National Historic Register. Then continue to Kingsley Plantation, at the end of the island. Here you browse interpretive exhibits on the plantation life of days gone by. This circa-1780 estate, established by Zephaniah Kingsley Jr., once produced indigo and Sea Island cotton. Kingsley took a teenage African princess, Anna, as his wife. Anna Kingsley later held a central role in creating a free black community. You shuttle from Kingsley Plantation to St. Augustine (about 90 minutes) and check into your bay-front accommodations. America’s First City, as it is often called, celebrated the 450th anniversary of its founding in 2015. Your Trip Leaders can recommend great options for dinner on your own, all within an easy walk. You ride from your inn over St. Augustine’s famous Bridge of Lions, cycling through local neighborhoods. Your destination is Anastasia State Park, which comprises 1,600 acres of rich ecosystems and abundant wildlife. Stop along the way to savor the breathtaking views from the historic St. Augustine Lighthouse. You are treated to a visit, showcasing some of the artifacts from the area’s earlier days. Once at the park, explore up to four miles of pristine beach and the estuarine tidal marsh teeming with plant and animal life. Enjoy time on the beach. Then get back on your bike for a ride through the Lincolnville Historic District, a 45-square-block area of the city. Once a focal point for the Civil Rights Movement, the district today contains the highest concentration of Victorian-era buildings in St. Augustine, as well as a museum and cultural center. Along the way, you will stop for lunch at a local food truck. There’s time this afternoon to cycle to the Nombre de Dios Mission and the Fountain of Youth Archaeological Park. Discover the early history of St. Augustine before continuing across the bridge to the beautiful beaches in the seaside town of Vilano. Or return to your hotel and take a swim or grab a refreshing drink. You may take an optional student-guided tour of historic Flagler College. Originally built as the Ponce de Leon Hotel, it includes the largest collection of Tiffany stained glass windows, and is listed on the National Register of Historic Places. In the early evening, you cross the road to the City Marina and board the schooner Freedom for a delightful sunset sail. Feel free to join the crew as they raise the sails! After breakfast you will transfer (30 minutes) and then a morning ride takes you inland to the fertile fields and small communities of rural Florida. Pedal past acres of potato fields, mostly on quiet roads. Views of the St. John’s River keep you company for a portion of your ride. After lunch, transfer back (30 minutes) to St. Augustine and relax or explore the city. Gather with the group tonight for a farewell dinner celebration. After breakfast you have included admission to the Lightner Museum. Built in 1887 in Spanish Renaissance style, the impressive three-story building now contains fascinating relics from America’s Gilded Age, including a fine collection of decorative and fine arts. Checkout time is 11:00 a.m. VBT has made arrangements for a shuttle from the hotel back to the Jacksonville International Airport (JAX). The shuttle departs St. Augustine at 11:00 a.m. Travel time is approximately 60 minutes. Flights departing before 2:00 p.m. are not recommended. If you need to travel at a different time to the airport in Jacksonville, taxis are available, and the fare is approximately $125. If you drove to the starting point of the tour, your Trip Leaders will shuttle you back to Fernandina Beach at 11:00 a.m. to retrieve your car around 1:00 p.m.
As always, the van and leaders can accommodate other options. Routes on tour may vary due to guest safety, comfort or unforeseen circumstances. This boutique-style hotel is an architectural salute to the rich Spanish traditions of St. Augustine. Its interconnected cottage-style buildings feature tiled roofs and wooden balconies. The hotel comprises 19 different buildings that are set around an inner courtyard and connected by an interior corridor. All of St. Augustine is right outside your door, from the historic Spanish Quarter to the Castillo de San Marcos. Guest rooms include a coffee maker, mini-refrigerator, and a spacious desk with two phones and voicemail. Free high-speed Internet access is available throughout the hotel. The Hoyt House Inn of Amelia Island’s town of Fernandina Beach offers luxurious guest rooms, romantic elegance, a gourmet breakfast, and—above all—true Southern hospitality. Enjoy a relaxed atmosphere and fine amenities throughout your stay. The inn is one mile from the beach and in the heart of the Historic District, a 50-block region ideal for strolling. Hoyt House is just steps away from Fernandina Beach’s marvelous restaurants and boutiques. Grab a rocking chair and relax on the porch with morning coffee or an evening drink, or slumber underneath a tree by the pool. 6 Days. Includes bike vacation only. Please note: Web Special savings cannot be combined with any other offer. Standard Terms & Conditions apply when purchasing this trip. Prices include all airline surcharges and Government taxes and fees. Ask our Tour Consultants for details. Every effort has been made to produce this information accurately. We reserve the right to correct errors. Prices are based on preferences selected above, including meals and sightseeing as specified in What’s Included. All prices are subject to change. Departure dates and prices shown may be updated several times daily, and apply to new bookings only. The aroma of pine needles and the windblown mist of geysers await your arrival to the walker’s paradise of Yellowstone and Grand Teton National Parks. Welcome to a living picture postcard on the Continental Divide! Lakeside splendor and rich Vermont history and culture accompany you during exhilarating reels and ferry crossings along Lake Champlain. Find your perfect tour and reserve a spot with our easy online booking.